Our Mr. & Mrs. Mason Jar Set is the perfect summer wedding accessory. 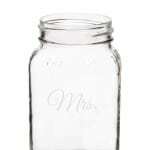 It includes two mason jars: one etched with Mr. & the other etched with Mrs. Both 26oz. 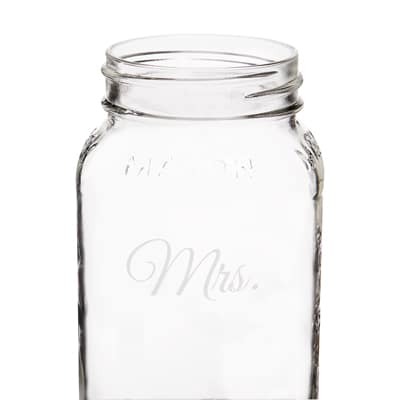 jars feature a beveled design, contoured silhouette and the words Mr. & Mrs. respectively etched onto the side. 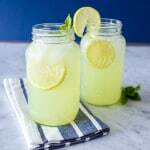 Whether you’re buying for your own wedding or giving as a gift, these jars will be treasured in your home and on your backyard patio for many years to come. They also can be gifted for anniversaries, Valentine’s Day or any other occasion where the love between husbands and wives is celebrated. Each jar measures 4” W. x 6.5” H. with a 11” circumference.